We know that Discord users love to keep up to speed with what their friends are doing. It's a blast to see what games pop up in everyone's status. That's why we are excited to take steps beyond JUST what someone is playing to give you more info about what someone is actually doing. 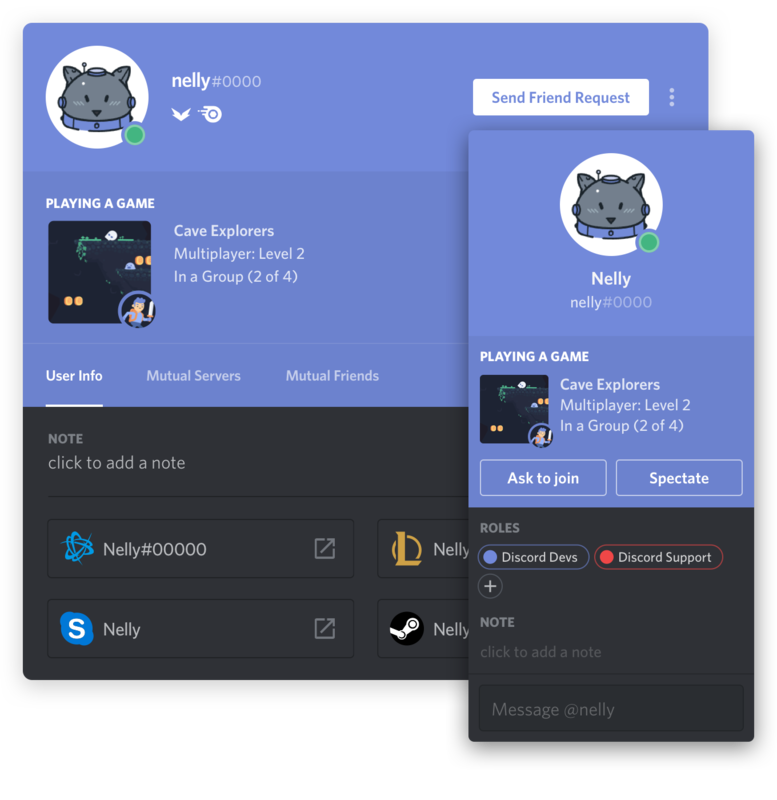 You'll also be able to send invites directly in Discord to join or spectate a game. Depending on the game, you'll be able to spectate directly from a Discord profile or even ask your friend if you can join their party. Group based games can allow you to post invitations to Join or Spectate in chat channels. We think this will be great for LFG channels or just skipping the frustration of finding each other in-game. Here's how to build your band of adventurers. Just launch your game & keep your eye on the + button in your chat bar. Once you see the Green Play Button, click it to drop the invite directly into chat! Getting into the action is just as easy as creating an Invite! Just click that big green 'Join' button from chat, and you'll be playing right away! IMPORTANT NOTE: You'll need to have run the game at least once for Discord to detect it! If your friends are already in the thick of battle, you can join easily by clicking the 'Ask to join' button. To jump right into the action, just click on the username of the person you want to join. Then, in the user pop-out, click the 'ask to join' button. A bar will then appear at the top of your Discord window where you can cancel the request. Furthermore, once the request is accepted it will change to a green button that says 'Launch game and join'. Voila! IMPORTANT NOTE: Someone asking to join you? You'll get a message in game and all you have to do is follow the on screen prompt to approve! Sometimes invites need some help to work perfectly! Here are some common errors that may come up. Trying to join a friend and you're getting a 'Game not Detected' error? Super easy fix! In order for Discord to recognize that a game includes these features, you'll need to have launched it once since they were incorporated into the game. TL:DR - Get the message above? Launch game, then retry! If you're missing the green play icon under your + button, it's an easy fix! Double check to make sure that you are allowing Discord to share your Game Status under User Settings -> Games -> "Display currently running game as status message." Also, make sure that the game you're trying supports sending invites and that you're in the right state in the game so people can join your party. To watch your friends capture the flag/move the payload/pray for RNG to be on their side - simply head on over to their profile, and click on the 'Spectate' button. The game will launch and you'll start spectating if the game supports Spectate mode. Important Note: You must own the game you want to spectate, since we launch the game for you to spectate in! You must also be friends with someone in order to spectate their game! The Rich Presence API is now live. If you're interested in incorporating these features into your game, head over to our developer's page.